Cross Laminated Timber (CLT) is the green choice for schools, health care facilities, public buildings, commercial buildings, and multi-family housing because of it’s cross-layered construction, huge carbon storage, beautiful finish and ready to assemble system. Ideal for floor, wall and roof systems; making it the perfect structural solution. A range of products made of large format, solid timber building elements. Wall, floor and roof components produced by cross-laminating spruce boards, cut to millimetre precision. 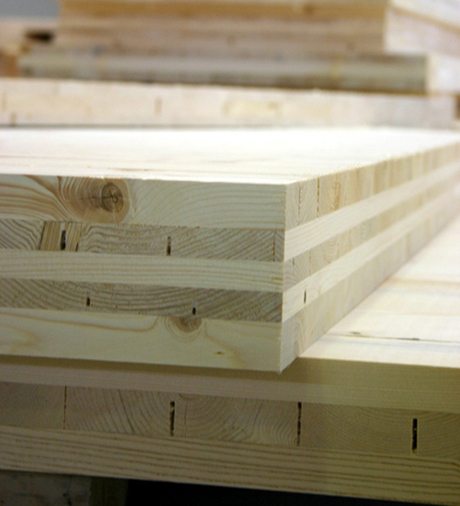 Using this production method, solid timber elements with dimensions of up to 4.80m x 20.00m can be produced. The thickness varies from 70mm to 310mm, which ensures the most cost effective cross-section for each construction. The cross-structure of LENO, with its high quality and durable bond, can guarantee components which are both dimensionally stable and resistant to warping. The simplest structures with respect to building physics, guarantee the most economical application in all areas of the construction process – whether as a standard floor, roof or wall panel or as an individually and precisely pre-fabricated, ready-to-assemble kit for entire buildings.